Pork Pibil is one of our fail-safe dishes when we eat at Wahaca. No matter what we choose, you can guarantee this will be on the list! 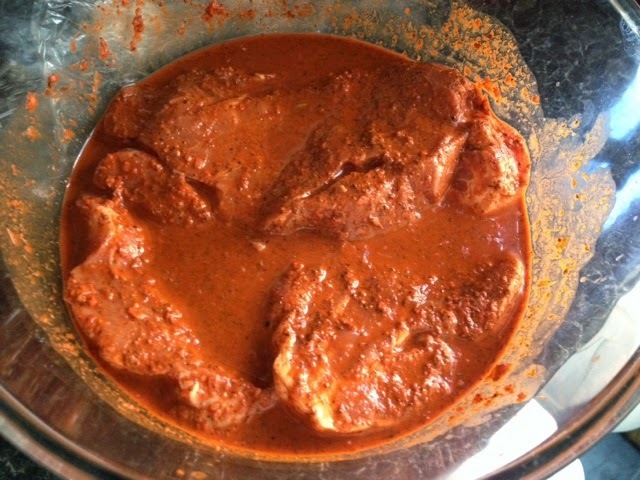 When I saw the recipe in Wahaca Mexican Food at Home I couldn't wait to try it out, but alas the gods were against me - I needed to get hold of one vital ingredient; achiote* paste. MexGrocer came to the rescue via Santa, and in my Christmas stocking there it was (and boy could we smell it!). The cooking process is very simple, tip everything into a pan, add a chopped (hot) chilli and a nob of butter and bring to a simmer. Then cover tightly and slow bake in a very low oven for 3-4 hours. In the meantime you can make your pink pickled onions (which really are worth doing); mix a thinly sliced red onion with the juices of a whole lime and half an orange, add a de-seeded chopped (hot) chilli, and leave for a couple of hours to do its thing. 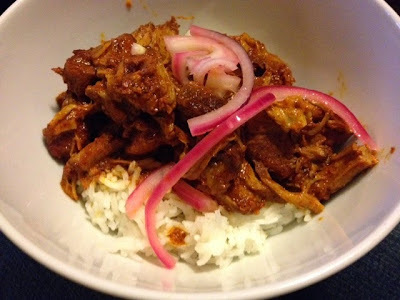 After a lot of waiting and an amazing smell permeating the house, you end up with this; shred the meat, and serve with rice, tortillas and your pickled onions as a garnish. It was well worth the wait! *interesting fact, whilst typing this I happened to randomly have Food Unwrapped on in the background, and discovered that the seed (annatto) which gives Red Leicester its colour is also the seed of the achiote tree!